It sounds like a story from a horror movie. 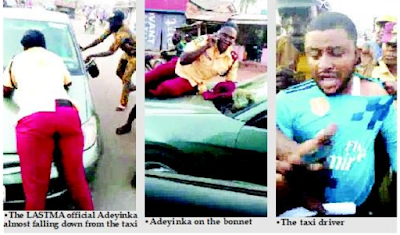 In full public glare, a taxi driver hit a traffic manager and drove off with her as she hung on the hood of his car. According to Lagos Traffic Management Authority (LASTMA) official Adeyinka Seriki, it all happened in Ikorodu on the outskirts of Lagos on Thursday at 6.35pm. She told The Nation, at the weekend, that she hung on the car hood from Igbogbo Garage on Ikorodu Road to Oluwanishola Filling Station on Baiyeku Road. Seriki said: “I was at my duty post with another colleague. Usually, anytime from 4pm, traffic gets busy in the area. We were controlling traffic when the taxi driver came and parked in the middle of the road. He caused gridlock. We told him to leave, but he refused. I tried to rebuke him and let him know that what he was doing was bad, but he sped off. He hit me with the car and I fell on the bonnet (hood). “If I had not fallen on the bonnet, the car would have crushed me. When I fell on the bonnet, instead of him to wait, he moved on with a high speed. I struggled to hold to something on the bonnet; he still drove on high speed and was swerving, trying to throw me down, but I held on to something. While the car was moving, people were trying to stop him, but he sped on and no one could stop him. Even when a trailer was coming, he tried to swerve me to the trailer so that I would fall off from the bonnet, but I thank God that I did not fall. I held the bonnet tightly. An eyewitness, who drove behind, later overtook him and he stopped at Oluwanishola Filling Station on Baiyeku Road’’. She said her hands were still hurting from the horrible experience. The LASTMA official also has bruises on her knees, which the vehicle hit, while her shoulder was dislocated. “I’m now receiving treatment. It should not be when LASTMA officials are killed that the matter should be taken up. This taxi driver should pay for what he has done. It is sheer wickedness. He is like a murderer, he should face the consequences of what he has done,” Seriki said. An eyewitness, Oyeyemi Akieu, a security expert, said he was going home when he witnessed the incident. Akieu added: “This made me to bring out my phone and I recorded the incident, which lasted for about five minutes, covering about 500 metres. “I overtook the cars ahead of me. I overtook the taxi driver and stopped in front of his car near a filling station. So he had no choice but to stop. Immediately he did, commercial motorcyclists (okada riders) and passersby, who witnessed the incident, ran towards him. Later, other LASTMA officials and the Police Mobile Force (MOPOL) came around. The Head of Zone 33, Ogolonto, Ikorodu, Mr. Kayode Odunuga, said he got a distress call from Adeyinka and her colleague after 7pm of the fateful day that they needed attention. “We urgently called the attention of the commander of Mobile Unit 63 Igbogbo, and three armed men were deployed, who traced our officials to the incident scene. The vehicle was recovered, but the driver bolted. The vehicle was taken to Igbogbo Police Station. We learnt the driver lives in the area. He fled when he sighted the police,” Odunuga said.